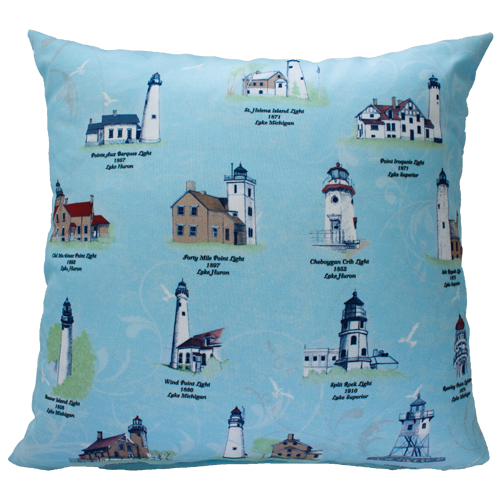 This Lighthouses of the Great Lakes Pillow features 27 different lighthouses from around the Great Lakes on a light sea blue background. 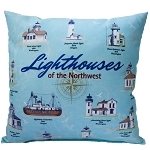 Place this 12" x 12" pillow in your home and evoke pleasant lighthouse thoughts throughout the year. 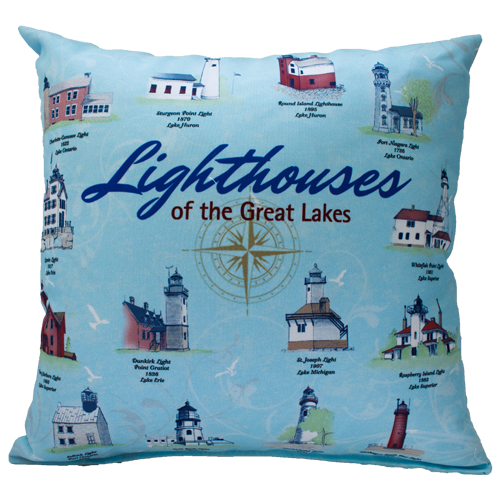 Lighthouses featured on the pillow include: Charlotte-Genesee Light, Sturgeon Point Light, Round Island Light, Fort Niagara Light, Lorain Light, Whitefish Point Light, Two Harbor Light, Dunkirk Light, St. Joseph Light, Raspberry Island Light, Selkirk Light, Split Rock Light, Marblehead Light, Muskegon South Pier Light, Pointe Aux Barques Light, St. Helena Island Light, Point Iroquois Light, Old Mackinac Point Light, Forty Mile Point Light, Cheboygan Crib Light, Isle Royale Light, Beaver Island Light, Wind Point Light, Rawley Point Light, Eagle Harbor Light, Fort Gratiot Light, and Grand Marais Light. 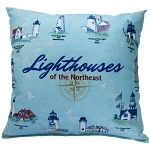 Beautifully designed, decorated and sewn in the USA.